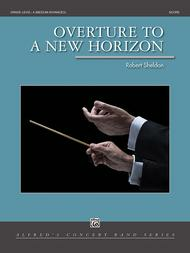 Overture to a New Horizon composed by Robert Sheldon. Concert Band. Concert Band; Part(s); Score. Alfred Concert Band. Grade 4. 280 pages. Published by Alfred Music (AP.41955).This tuneful and effervescent piece was inspired by the passion and energy of the New Horizons Band movement and the countless adult "beginners" who have discovered the joy of music-making. (5:10)Concert/Contest; Festival.